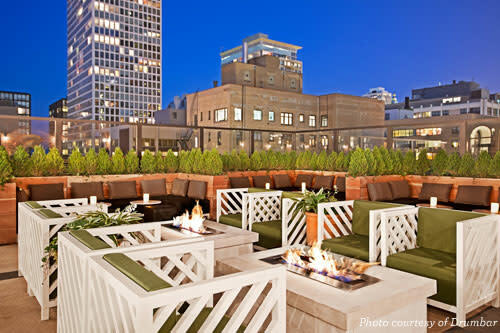 Nightlife elevated: Make the most of summer nights at 8 of Chicago's best hotel rooftops. 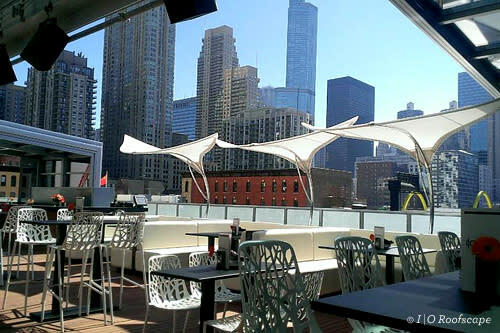 Chicago rooftop bars dot the landscape, all with different experiences and vibes of their own. Serene open-air retreats or late-night party scenes. Views of endless blue waters or downtown skyscrapers. Take your pick with this nightlife cheat sheet touting eight of the best Chicago hotel hotspots. Perched above a historic hotel, this lofty rooftop restaurant and open-air terrace has a breezy, sun-filled atmosphere reminiscent of a Great Lakes beach house with its string lights, whimsical greenery, and communal, picnic-style seating. And the views? Breathtaking vistas of Chicago&apos;s Millennium Park and Lake Michigan. 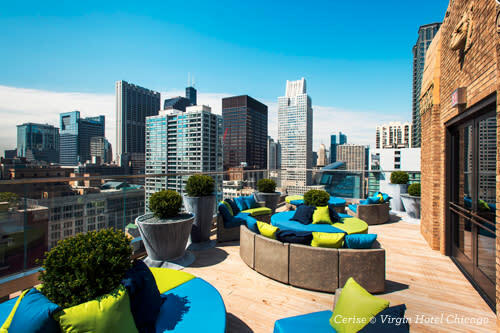 This sky-high spot at the Virgin Hotels serves up light bites (from chicken tacos to cake pops) and fun refreshers (like beer-infused cocktails, Moet spritzers and batch orders for groups) along with unique views of the downtown Loop architecture: bustling office buildings, the Chicago River and even the top of the Willis Tower. 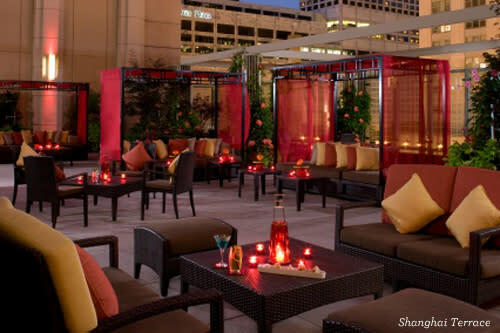 It&apos;s newer and it&apos;s definitely a young party scene so if the crowds get too much, the hotel&apos;s lower level hangouts make for a good back-up option. Dark woods, dim lights and rich leathers adorn the indoor bar of this Golf Coast craft cocktail-focused spot, while the hip outdoor terrace is the perfect place for socializing under the night sky. 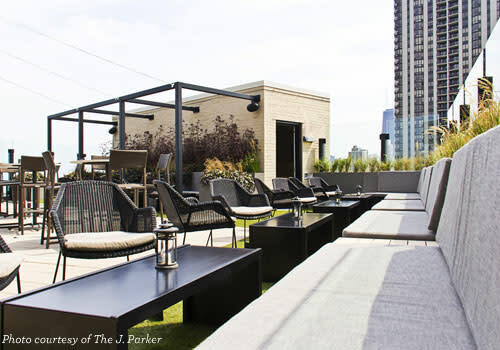 This chic River North rooftop spot features a seamless indoor-outdoor space, complete with a fire pit, water elements, a video wall and a plush VIP area. Groups throng here and the lines can build up late in the night so plan to arrive early — and well dressed! Take in the views from indoors and out. The glass-walled lounge of this neighborhood hotspot offers year-round scenery, while space on the sun deck is worth the wait. Look eastward for unobstructed views of the boats on Lake Michigan and the treetops and lagoons of Lincoln Park, a 1,200-acre oasis of greenery. Gourmet small plates come from the acclaimed kitchen helmed by award-winning chef Paul Virant. Deep reds and elegant Asian décor evoke a 1930s supper club vibe, while the prime location overlooking The Magnificent Mile offers an ideal photo opp. Intimate cabanas and a spacious set up leave you with room to relax in quiet sophistication. Enjoy the low-key pace and attentive service while noshing on dim sum and traditional specialties from potstickers to Peking duck. With sweeping skyline views, The Bistro at Streeterville Social provides a casually chic environment to take in the city’s favorite season with inventive bites and refreshing sips. 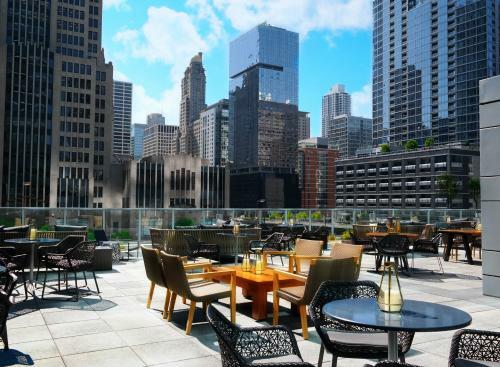 The sun-soaked urban escape above Downtown Chicago has everything for laid-back days, happier happy hours, and picture-perfect nights. The Bistro, open daily, weather permitting, serves gourmet summer fare alongside refreshing cocktails with city views. 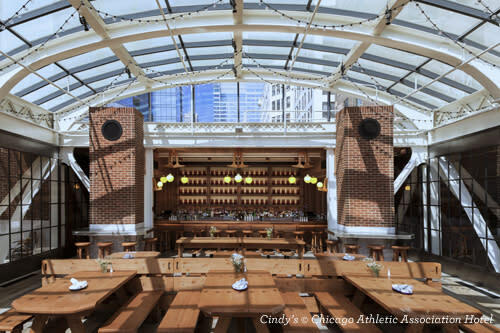 The Bistro provides a relaxed environment with views of Chicago’s skyline. This luxurious River North enclave provides perhaps the most dramatic cityscape views in all of the city. Look down below at the Chicago River to see where it meets Lake Michigan, while at eye-level the Wrigley Building clock tower looms bright white and beautiful. The award-winning bar team has you covered, and as this is the Trump, the "bar snacks" come in the form of lobster towers and wagyu sliders, which you can top off with a $100 sundae.